The WE Knife Co. Eschaton showcases Elijah Isham's unique design aesthetic, and introduces what he calls a 'sub-integral' frame design. Its frame is made from a single piece of titanium, while the upper section of the handle is outfitted with stylized carbon fiber scales. 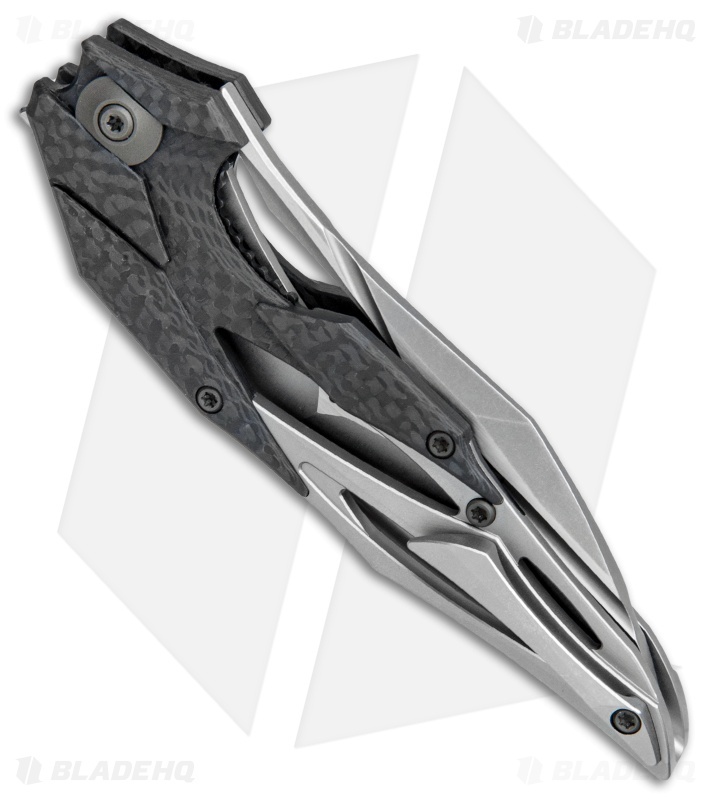 The futuristic wharncliffe blade is made from durable Bohler M390 stainless steel with a flipper opener and distinctive thumb cutouts. 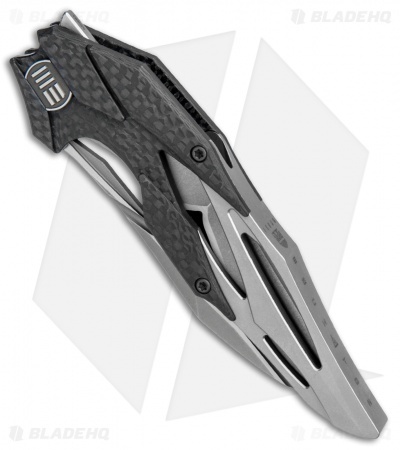 Weighing in at only 3 ounces, the Eschaton is a convenient EDC folder that sets itself apart from the crowd. Limited edition run of just 700 knives. Ultra-lightweight, sub-integral design made from resilient materials. Ceramic ball bearing pivot provides smooth and responsive flipping action. Machined titanium pocket clip for secure tip-up carry. This knife looks so unique. The design is going to be polarizing and you are either going to love it or hate it, but for me I love it. Everything about it has been well thought out. The openings in the blade act as thumb or finger holes to deploy the blade or "Spydie Flick" it. The flipper works great, the blade is drop shut smooth, and the ergos are surprisingly top notch. You wouldn't think this knife would be comfortable to EDC but it is, especially when you choke up on it. Even though the blade is large, it folds up tight and carries very easily. It feels quite small in the pocket. If there are any more available, jump on it before it's gone. Form and function is Awesome! I bought 2 of these knives and Im happy I did!! Excellent design! Wonderful piece of knife art I’m happy to have in my collection. Snaps open without any effort! Feels very sturdy! I bought a second after the first arrived for my brother in-law! Unreal quality unreal production value. 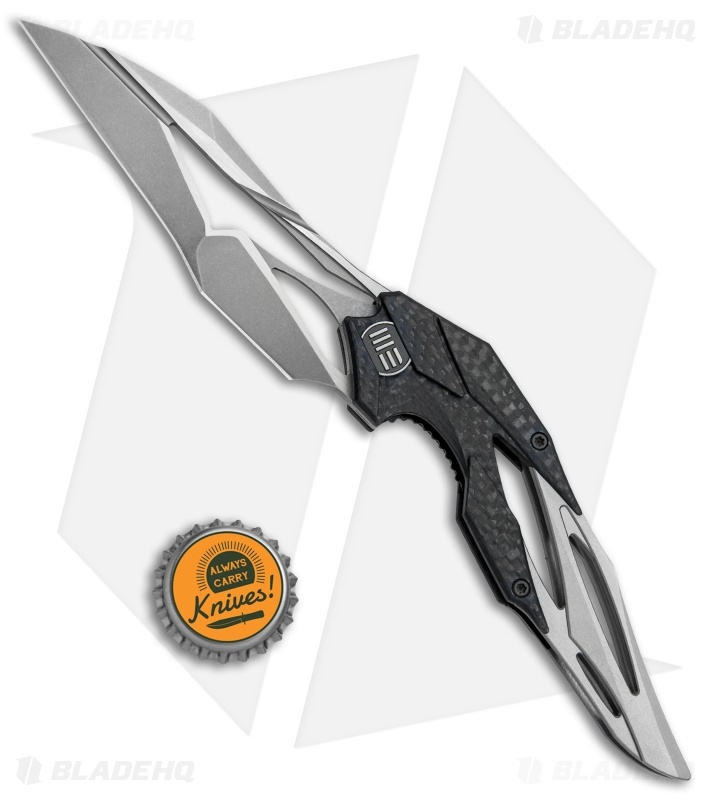 Makes me want to buy we knives the company. It’s not a soft user knife it’s made for the purpose of every day use and more. Just everytime u use it ur going to smile and feel pride no Bullsh/t. Great knife!!! An ugly knife whose looks grew on me until I had to own one. Great design and sharp out of the box. This is an EDC knife that will stay in my show case. I know, this thing looks nuts. The angles are insane and it's got more holes than a block of Swiss, but believe me when I say that the design elements on this knife are both intentional and practical. The strange angles in the blade don't just add to the flow of the knife. Each one is an invisible thumb stud, or ramp to flick the knife open with. The seemingly bizzare holes in the handle, paired with featherweight materials like carbon fiber and titanium mean that this almost 9 inch knife weighs only 3 ounces. 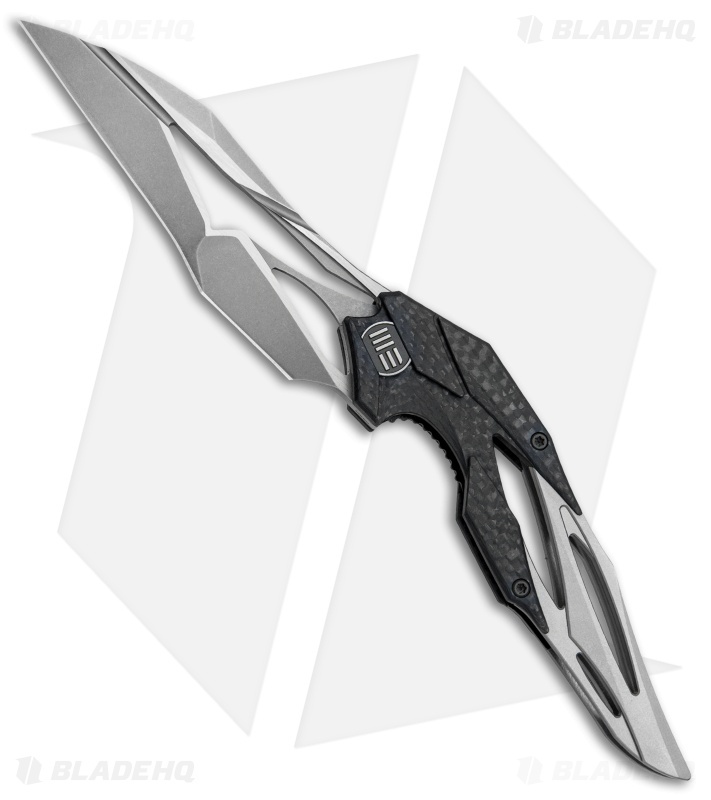 That's the first thing you'll notice about this knife, it's incredible light weight. The second thing you'll notice is how fantastically smooth the knife is. It fires open with a flick of your finger and you can expect it to freefall closed like any custom on the market. Did I mention it cuts stuff? I took this bad boy right through some venison back straps I was working on the night I got it. Anyone who tells you a compound edge knife won't cut well clearly hasn't tried an Eschaton. Don't make their mistake. Try one of these bad boys out for yourself.